Join VL at Prosper Show 2018! That we’re headed back to Las Vegas for the 2018 edition! This year VL has upped the ante, as our very own Robin H. Smith will be taking to one of the Prosper Show stages! On the first day of Prosper Show, March 13th, Robin will be sharing his 23+ years of integration and ecommerce technology experience with an audience of top Amazon sellers from around the globe. Keep an eye out for signage for “The Right Questions to Ask When Shopping for Software for Long-Term Profits” when you’re at the show — you won’t want to miss this talk! Attendees will be leaving with insight that can be implemented almost immediately. Haven’t registered for Prosper Show 2018 yet? Use VL OMNI’s Code 18xVL for $100 off a general conference pass! Even though Prosper Show is only in its third year, it has quickly become the show for not only elite Amazon retailers, but for etailers of all sorts looking to continue to push their businesses to new heights. The amount of quickly growing SMBs and burgeoning small enterprises VL spoke with at last year’s show was mind-boggling — we’ve never seen so many like-minded retailers in one room at once! But perhaps what attracts attendees most to Prosper Show is their education-first stance on how the conference is organized. Yes, you read that right — education is the core mission that Prosper Show has been built on year after year. While there’s still space for exhibitors to set up shop (you’ll find VL at Booth 107 this year, right by the main doors), this is not the show for large booths and swag. Instead, Prosper is a much more tailored show. With smaller exhibitor booths, Prosper makes it much easier for the knowledge- and solution-hungry crowd to speak with as many potential partners and solution providers as possible across the two days the conference runs. With less exhibition floor to cover between sessions and a great spread of food to bring attendees into the exhibition hall, if you’ve never been to Prosper as an exhibitor, be prepared to be impressed. At last year’s show, VL had amazing conversation after amazing conversation, and are looking forward to much of the same from this year’s show! The audience that Prosper attracts also makes it a great show to launch new technology or feature key announcements. Being early on in the trade show season, Prosper attendees will notice that more than a few exhibitors will be making exciting announcements at the show. Last year, VL officially launched our VL OMNI Dashboard. You’ll have to stay tuned in to our blog to see what we have in store for this year! Prosper Show is also gaining momentum. 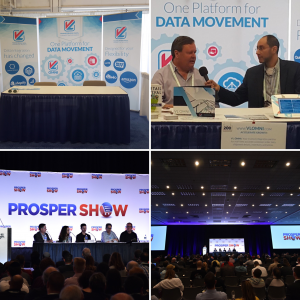 The community that is and serves the omnichannel retail market has noticed the importance of Prosper Show as a new addition to the conference rotation. Making several ‘top shows to watch for‘ lists for 2018, expect to see some great and familiar brands at this year’s show. No spoilers, though — you’ll have to attend to see! And as an exhibitor and a first-time Prosper Show speaker, VL can attest that Prosper also attracts some great media attention, too! Check out Robin H. Smith’s interview with Dr. Jeremy Weisz, where the two chatted on the successes and challenges of being an entrepreneur. With many great speakers lined up for Prosper Show, and even more exhibitors signed up for booths to speak with knowledge-hungry attendees, Prosper Show 2018 is not one to miss!